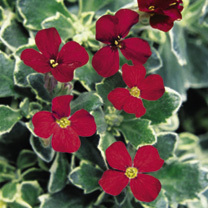 We all know the aubrieta is a great ground covering perennial, and the purple red flowers of Swan Red will make a real focal point in your spring-summer garden. Your aubrieta plants will be smothered in flowers in spring and into early summer, brightening your borders with this much-loved favourite. The plants create mounds of small, attractive foliage which can also trail over walls. April will see them covered with masses of flowers, adding colour to your garden during the early part of the year before many other plants start to flower. Swan Red - Purple-red flowers and attractive variegated foliage. Flowers May-June. Supplied in a 9cm pots. Ideal for beds and borders, patio pots and containers. Attractive to bees, butterflies and pollinators. Prefers full sun or partial shade.